Scooper - Technology News: Which are China’s fastest growing cities? 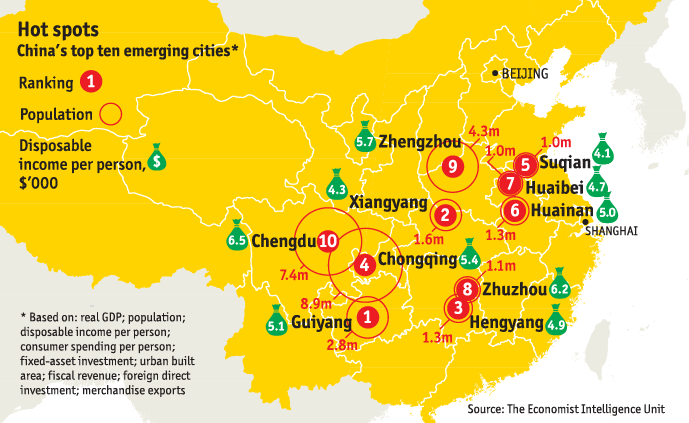 Which are China’s fastest growing cities? Although the days of 30% annual growth might be a thing of the past, China still boasts many cities experiencing rapid growth. These are cities that few outsiders will have heard of – such as Guiyang, Xiangyang and Hengyang – but in 2016 their economies are forecast to grow by as much as 12%. For Qian Liu of The Economist Intelligence Unit , these 10 emerging cities “reflect the shift of China’s pattern of growth: away from export and towards import; from investment to consumption; and from manufacturing to services”. First-placed Guiyang is reflective of this change. Once reliant on state-owned industry, the city is now emerging as a centre for big data. Alibaba hosts a cloud-computing facility in the city, a new science park is in development, while state telecoms companies are investing in data centres. Hengyang and Xiangyang have also seen changes in industry, with many manufacturers moving to these inland cities. Electronics producer, Foxconn, has invested in Hengyang, and Xiangyang’s industrial park, local government schemes and labour pool are all driving investment in the city. Other cities are also seeing increasing incomes and spending, helping to drive growth. The top 10 rising cities are measured based on nine indicators. These include real GDP, FDI and consumer spending per person. With a combined population nearly double that of the Netherlands, they highlight that growth patterns can be successfully adapted. The 10 largest cities in China Why are China’s cities becoming less crowded?